METHOD: PLACE INTO A BOWL HALF A TUB OF QUARK, 4 EGG YOLKS, 1 TSP BAKING POWDER AND 1/2 TSP VANILLA ESSENCE TO TASTE, MIX TOGETHER WITH ELEC WHISK & SET TO 1 SIDE. PREHEAT OVEN 180 DEG/GAS 4. 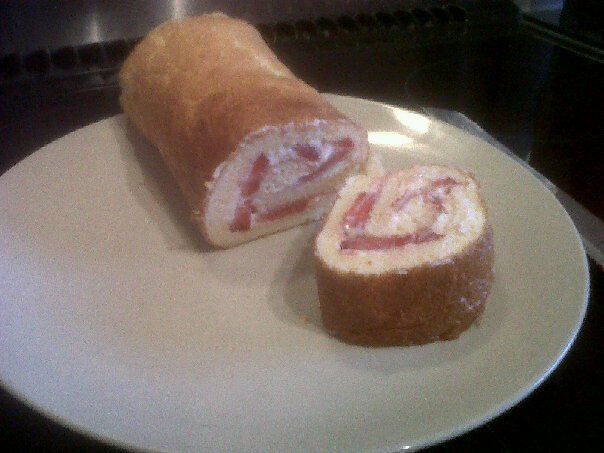 INTO ANOTHER BOWL, WHISK THE EGG WHITES UNTIL TH...EY ARE STIFF AND FORM PEAKS, WHISK HALF THE EGG WHITES INTO THE MIXTURE IN THE 1ST BOWL AND WHEN COMBINED FOLD IN THE 2ND HALF OF THE EGG WHITES..........LINE SWISS ROLL TIN WITH BAKING PAPER & BAKE FOR 15/20 MINS.......ALLOW TO COOL.....WHILST COOLING, MIX THE REMAINING HALF OF TUB OF QUARK WITH THE SWEETNER AND SOME VANILLA ESSENCE TO TASTE, SPREAD OVER THE COOLED ROULADE, ADD CHOPPED FRUIT, ROLL IT UP & SCOFF THE LOT FOR ONLY HALF A SYN!!! WOOHOO, IT'S GORGEOUS!